Bake biscuits as directed on bag. Meanwhile, in 10-inch nonstick skillet, melt butter over medium heat. Add onion and mushrooms; cook and stir 2 to 3 minutes or until onion is crisp-tender. Reduce heat to medium-low; stir in gravy, Worcestershire sauce and thyme. 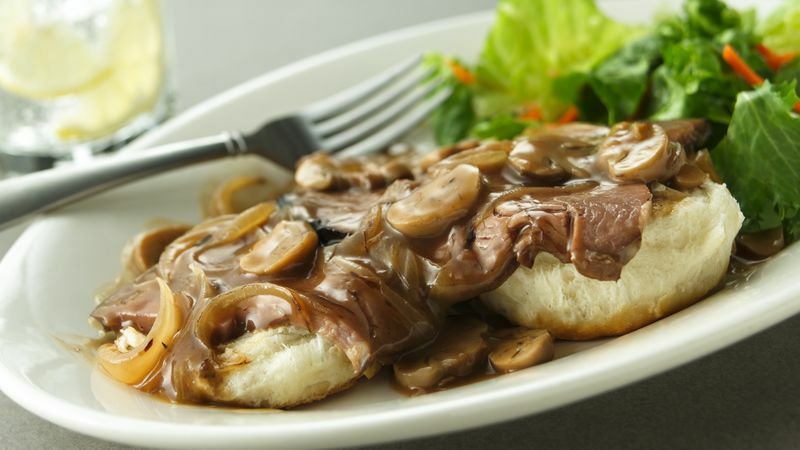 Cut beef slices crosswise in half; add to gravy mixture. Cook over medium-low heat 2 to 3 minutes or until hot. Split biscuits. Place 2 biscuit halves, cut sides up, on each of 2 individual plates. Top with beef and gravy mixture. Serve with mashed potatoes and green beans.